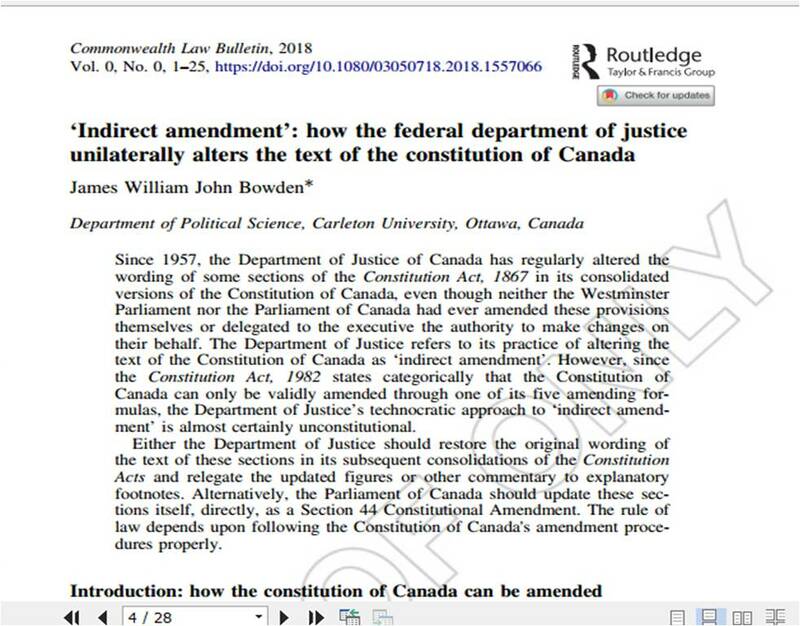 The third such endeavour will appear in the Journal of Parliamentary and Political Law, which in 2019 will publish my project “Canada’s Legal-Constitutional Continuity, 1791-1867.” I’ve been exploring this topic since 2015, first with a small article in The Dorchester Review examining how the Government of Canada was then preparing to mark “Canada’s 150th Anniversary” in 2017, and later with a conference paper at the “Canada at 150” Conference in Montreal in May 2017. Ultimately, this entire project also came to fruition because of one small and seemingly unimportant observation: I noticed that Alpheus Todd described one of Sir John A. Macdonald’s terms as prime minister as having commenced not upon Confederation in 1867 but rather in 1864, when he and George-Étienne Cartier and George Brown formed the Great Coalition in order to make Confederation happen. Surely, we in the 21st century know the history of Confederation better than an eminent historian of the 19th century who lived through it, so Todd must have been mistaken! Finally, The Dorchester Review just published an abridged version of another interesting project that I’ve been working on this year on Canadian-Commonwealth Caribbean relations. In this case, I’ve examined especially a proposal under consideration between 1917 and 1919 that the Dominion of Canada would inherit from the United Kingdom the various Caribbean islands which make up what was then called the British West Indies. Between 2004 and 2014, there was a lot of idle talk that Canada would somehow take on the Turks and Caicos as its fourth territory, which culminated (and collapsed) when the Prime Minister of Turks and Caicos, then Rufus Ewing, visited Ottawa. But one hundred years ago, there was a chance that all the Commonwealth Caribbean could have become part of Canada. It’s a very interesting story, which you can read in The Dorchester Review. Follow the threads of your research, for you might be surprised where they lead you! Still waiting for provincial fixed-date election experience!